“The Journey Continues” was a theme of today’s Foothill Gold Line conference. Pictured (left to right) are Metro board chair John Fasana, Construction Authority CEO Habib Balian and Chief Project Officer Chris Burner and Metro Deputy CEO Stephanie Wiggins. Photo: Joe Linton/Streetsblog L.A. The Metro Gold Line Foothill Extension Construction Authority hosted a one-day State of the Project 2016 conference today at Pomona College. 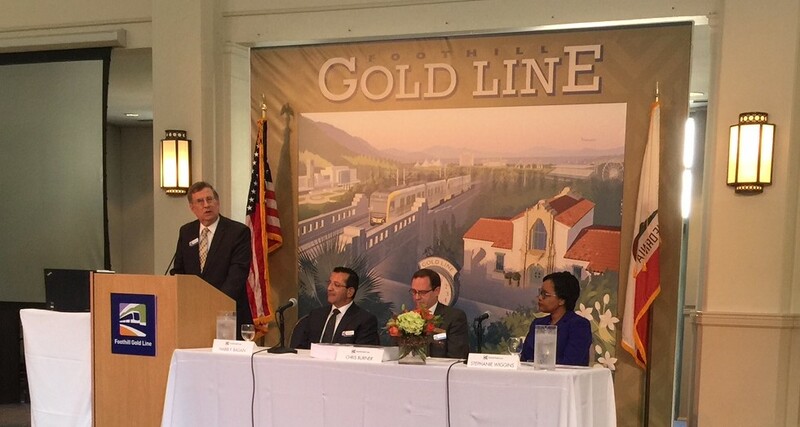 Elected officials, agency leaders and others gathered to hear some success stories from previous segments, but mostly to look ahead to extending the Gold Line eastward to Montclair, and possibly further. 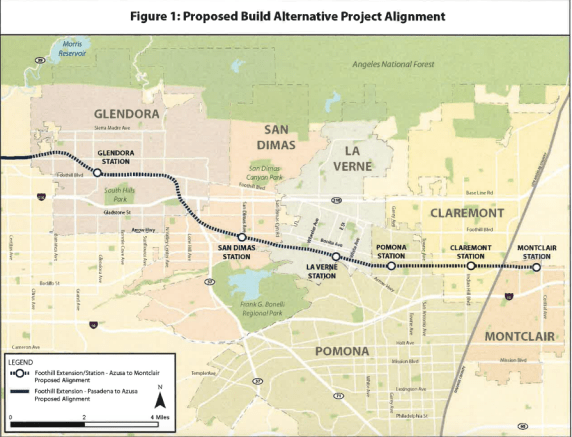 The Foothill Gold Line’s next phase eastward, referred to as phase 2B, would extend 12.3 miles to just outside the L.A. County border with San Bernardino County. Stations would be located in Glendora, San Dimas, La Verne, Pomona, Claremont and Montclair. The phase already has environmental clearance, and the construction authority’s board recently approved engineering designs. At today’s event, construction authority leadership shared characteristics of the Glendora to Montclair extension. The phase is anticipated to cost $1.2 billion, of which still needed are $1.15 billion from L.A. County and $63 million from San Bernardino County. There will be four times more station parking than the prior Pasadena to Azusa segment. The new light rail runs in the same right-of-way as BNSF and Metrolink trains, hence there will complicated relocation of tracks to make space. The light rail stations will be in the middle of the tracks, making for less confusion for riders, but also necessitating some pedestrian under- and over-crossings. That next extension dominated the conversation, but what really hung over the conference was Measure M, Metro’s sales tax which goes to L.A. County voters on November 8th. If passed, Measure M will fully fund the Gold Line within L.A. County. The mayor of L.A. Eric Garcetti and three congressmembers – Garce Napolitano, Judy Chu, and Norma Torres – all stressed the importance of passing Measure M. Congressmember Chu called Measure M “the one great hope” for extending the Gold Line. Torres spoke on the need for inter-county cooperation to get the line to Ontario Airport. All emphasized that everyone present should not only vote for Measure M, but get the word out to friends, family, and others. Congressmember Napolitano joked that Mayor Garcetti should have brought and handed out lists of voters for people in the room to call in the coming weeks. Perhaps most telling was Construction Authority CEO Habib Balian’s response to Metro Chair John Fasana’s question about any possible Plan B. What is the back up plan for the Gold Line if Measure M does not pass? Bailan, who had been speaking enthusiastically, responded more quietly that there might be some federal funding, but that would likely delay the project 30 years, or maybe state cap-and-trade funds, but those have been faltering recently. If Measure M passes, phase 2B of the Gold Line is ready and should be among the earliest projects underway. If Measure M fails to get the necessary two-thirds, the future of the Gold Line is a whole lot less clear. Tough to get excited about this one. Hope their park-and-rides each hold 5,000 cars or more. Metro is a transit agency not a parking lot operator. Parking is an enormous waste of transit dollars and any Metro parking should be converted to multi-unit housing as soon as possible. Caltrans currently operates their second-largest park-and-ride facility in the state at Montclair, which has around 1800 spaces. Additionally, this extension really makes a Metrolink + Gold Line/RTA + Gold Line/Omnitrans + Gold Line commute a viable option for those who live in the IE but work in the SGV/Pasadena areas as going to LAUS then backtracking on the Gold Line is currently not a timely option for most, so they don’t do it. Finally, cities along the extension (and the San Bernardino Line) have been rezoning and generally planning for the service, including for housing. This provides an opportunity to help keep people who are getting displaced from LA from having to move to more sprawling and auto-dependent areas or even having to completely leave the state. There’s a 1600/1800 space surface lot there now. Add one level of parking over all of it and it becomes 3200 spaces. Yes it can be converted to housing, but there will also be enough spaces to maintain the current parking capacities. And sorry, though I may also despise providing for the car-addicted, there is a role for parking at transit stations (especially terminus ones), if it is priced what the market will bear. The problem is that Metro has never done that until now. Fifteen percent of Metro ridership drives themselves to stations at an enormous cost for parking lots. Build housing in walkable neighborhoods next to Gold Line stations and those who live in areas requiring automobiles can find ways other than parking at the station to ride the train. Those who choose to live where they can walk to the station benefit from easy transportation without autos and those who choose to live in areas requiring autos benefit from not having the transit riders competing for road space.